When a full-sized meatloaf is a little too much, down-size with this recipe for delectable frosted meatloaf cupcakes, complete with mashed potato frosting! With the empty nest that we have going at our house these days, certain recipes are more of a challenge to make. Whole lasagnas, big casseroles of macaroni and cheese and regular size meatloaves are all just too much deliciousness without the Southern daughter and her posse around to share the eating. So my solution? I’m basically cupcaking everything. Lasagna? Cupcakes. Mac and cheese? Cupcakes. So it was pretty much only a matter of time before I cupcaked meatloaf…which by the way, was practically begging for a mashed potato frosting. Oh yeah. There is, of course, no reason why you can’t make meatloaf cupcakes for a crowd, but if it is just the two of you and one hungry hound dog, making the cupcake version allows you to either just make enough for the two of you (sorry puppy – kibble for you), or to have a very fun plate of leftovers for later in the week. It’s also a great way to use up leftover mashed potatoes, which is actually the thing that set me down the meatloaf cupcake road in the first place. 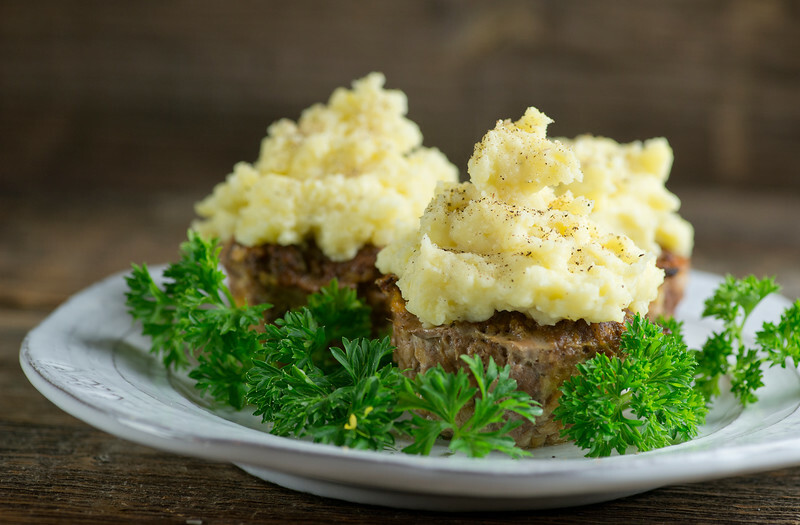 When a full-sized meatloaf is a little too much, down-size with this recipe for delectable frosted meatloaf cupcakes, complete with mashed potato frosting!Click to TweetStart by lining a muffin tin with non-stick foil. This is going to let you lift your meatloaf muffins right out of the tin, rather than trying to get them out with a spatula. Fill the tins with the meatloaf mixture – I’ve given you my version in the recipe below, but if you have a favorite meatloaf recipe by all means use that instead. Bake them up until the meatloaf is done – because the cupcakes are smaller than a regular meatloaf, this is only going to take about 30 minutes. When the little meatloaf cupcakes are done, carefully lift them out of the tin, using the edges of the foil. Let them sit for about 5 minutes to settle, then gently peel the foil off and transfer them to a platter or plates with a spatula. Grab a bowl of warm mashed potatoes and start frosting. Personally, I like to pile the frosting high when the frosting is made of warm, buttery mashed potatoes. Give the whole thing a grinding of black pepper (think of it as sprinkles!) and serve ’em up! I was very happy with one meatloaf cupcake for my dinner, but the Southern husband enthusiastically had two. And I can’t say that I blame him. I mean, CUPCAKES. 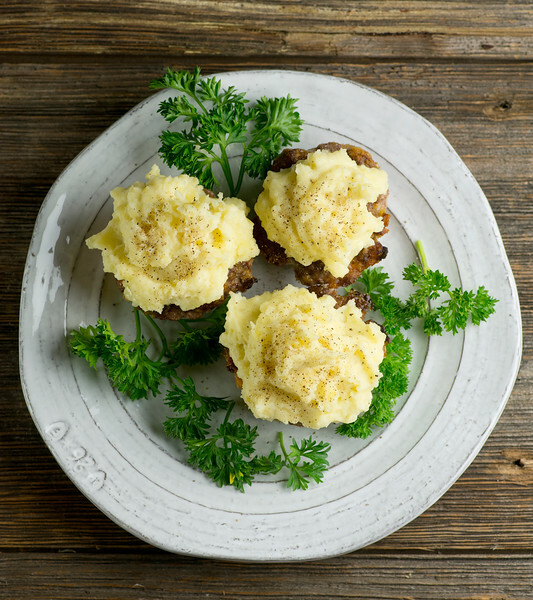 When a full-sized meatloaf is a little two much, down-size with this recipe for delectable meatloaf cupcakes, complete with mashed potato frosting! Preheat oven to 350 and line a 12-cup muffin tin with nonstick tin foil. Combine all ingredients except potatoes in a mixing bowl. Mix with clean hands until combined, and then divide among the muffin tin, smoothing the top. Bake until done, about 30 minutes. Let the cupcakes rest for 5 minutes, and then lift out of the tin, using the edge of the foil. Carefully peel the foil down and transfer to a platter or plate using a spatula. Frost the top of each cupcake with the mashed potatoes. Grind on a little more ground pepper and serve at once. This recipe is for 12 cupcakes, but if there are only two of you, you can cut the recipe in half or even in quarters. Simply beat the egg before you add it to the mixture and add half or a quarter. For a great idea! Happy New Year! I just found out that there is a cupcake like this! So unique and great! It looks easy to make! Thank you!